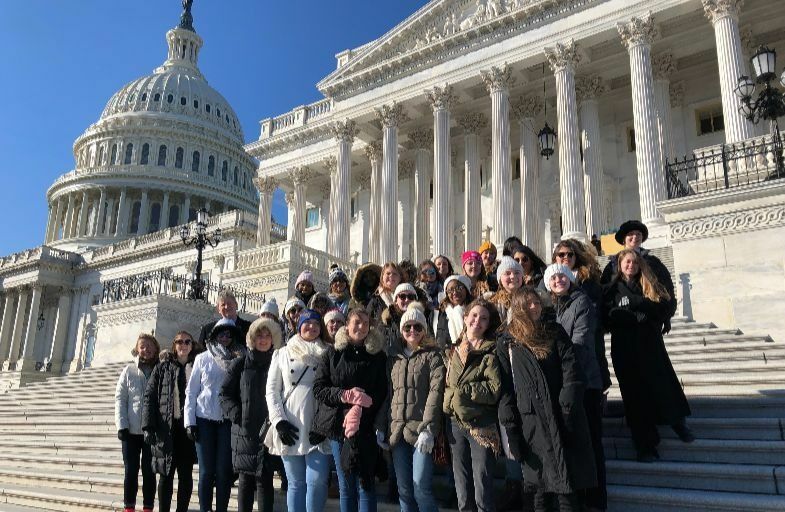 At McGehee, the junior class trip to Washington, DC is infinitely more than a sightseeing tour and this year was no exception. The juniors have been immersed all year in the federal government, learning its role and intricacies. Eleventh graders dove right into the action upon arrival with a visit to Mount Vernon, then to the U.S. House of Representatives, just in time to visit with Evelyn Shuler’s grandfather, Congressman Hal Rogers of Kentucky and to see the House debate and vote on a bill. They polished off the day with a trip to Cactus Cantina for dinner with local McGehee alumnae. A trip to the National African American History and Culture Museum blew everyone away as did a meeting with Dr. Doug Owsley, faculty member Jennifer Zitt’s former professor at LSU. Dr. Owsley provided the girls a behind the scenes look at his forensic anthropology lab at the Museum of Natural History. The day concluded with a trip to Ford’s Theatre for a performance of Twelve Angry Men. On Wednesday the day started with a visit to Capitol Hill and meetings with Louisiana U.S. Senators Cassidy and Kennedy and several Members of Congress. Juniors had the opportunity to ask questions of the Louisiana delegation and other Members of Congress on issues they have studied and followed throughout the school year. This year, a once in a lifetime opportunity occurred. Junior Conery Schmidt (through a family friend) arranged for a meeting with a U.S. Supreme Court Justice and a private tour of the Supreme Court. The girls and their chaperones met for over an hour with the Supreme Court’s newest member, Justice Brett Kavanaugh. The girls thoughtfully prepared questions prior to the meeting and remarked that they were very thoughtfully and thoroughly answered. On Thursday, the girls volunteered at DC Central Kitchen, lending a hand in preparing some of the 5,000 meals a day that DC Central Kitchen provides to homeless shelters and schools throughout the District. A tour of NPR, a visit to the Holocaust Museum and shopping in Georgetown concluded their Thursday. Friday morning the group packed up and headed to Arlington Cemetery before heading back to New Orleans. Of course no trip to Washington is complete without memorials, monuments, museums, and very chilly weather this time of year. A last minute bonus before today’s departure was SNOW!